In traditional martial arts, Staff, Saber, and Sword, in that order are the normal progression of weapon training. 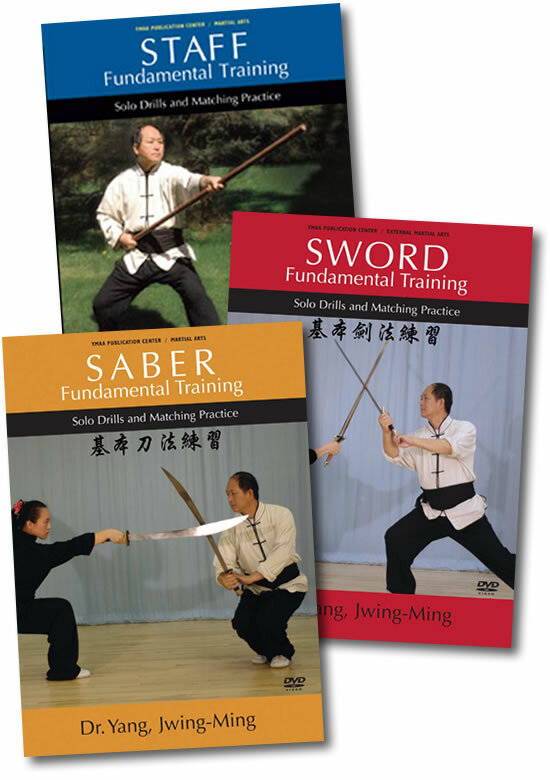 In this highly instructive collection, Dr. Yang will teach you the basics to intermediate level for each weapon and how proper learning creates a natural progression by building upon the foundations of each. Weapon training is exciting, and an important part of traditional arts. Bundle contains 3 DVDs. Dr. Yang, Jwing-Ming teaches Staff fundamental training and partner matching practice. The techniques are compiled from Taijiquan (Tai Chi Chuan) and Shaolin White Crane Gongfu (Kung Fu), offering uniquely comprehensive instruction of Southern-style Soft and Soft-Hard Staff training. Detailed instruction for each movement, and corrections while students demonstrate, making it easy for the viewer to refine their staff technique. Staff training develops the fundamental skills required for all other long weapons training, and it is traditionally the first long weapon learned in Chinese martial arts. Saber training develops the fundamental skills required for all other short weapons training, and it is traditionally the first short weapon learned in Chinese martial arts. Dr. Yang, Jwing-Ming teaches the fundamental techniques, solo drills, and 2-person matching practice for Saber training. He discusses the history of the Saber (Dao) and the strategies and proverbs related to the Saber. He explains the differences between Saber styles with examples from his private collection. Dr. Yang comprehensively demonstrates 25 fundamental techniques common to all Chinese martial art styles. Over two dozen solo and partner practices are taught, culminating in freestyle Saber matching training. Sword training raises the Spirit to a higher level of awareness and focus, and is considered the greatest achievement in Chinese martial arts. Dr. Yang, Jwing-Ming teaches the fundamental techniques, solo drills, and 2-person matching practice for Sword training. He discusses the history of the Sword (Jian) and explains the difference between Sword styles with examples from his private collection. Dr. Yang then comprehensively demonstrates 27 fundamental techniques common to all Chinese martial arts styles. Over a dozen solo and partner practices are taught, including freestyle Sword matching training. Dr. Yang offers detailed instruction and corrections of every movement as students demonstrate, making it easy for the viewer to learn.